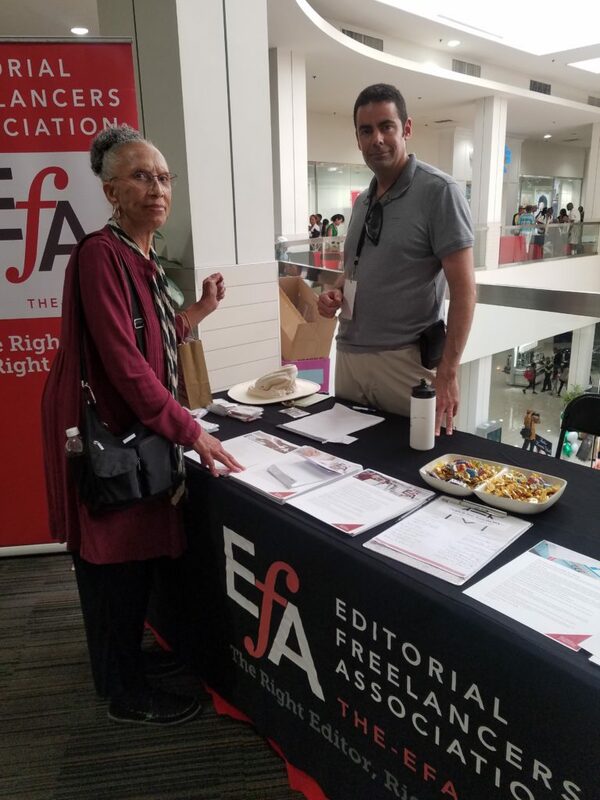 Cynthia Williams and Michael Jabbra of the EFA’s LA Area chapter represented the organization at the Leimert Park Village Book Fair on August 25, 2018. One hundred attendees—27 writers, 73 general inquirers—stopped by our table. Most had not heard of our organization. All were happy to see us at the event and took away totes and handouts on using the Job List and Directory, and on the different kinds of editorial services. Inquirers who were writers varied in their experience level. Some were seasoned authors who had speaking engagements at the event. Others were in the early stages of writing a manuscript or had written a manuscript and were thinking of self-publishing. One attendee left with an EFA postcard in the hopes of finding help with archiving the history of her organization. Those who weren’t writers were also curious about the EFA. Two mothers picked up several materials to share with their daughters who were writers and book lovers. The 2018 event was the 12th annual fair. From the attendee feedback, it seems our presence broadened the EFA’s reach and inspired many authors to push forward in the publishing process. We hope to return next year!